PRESS RELEASE: Palmer proudly introduces a group of robust and high quality guitar effects, The Root Effects Series. The pedals range from a solid, round sounding distortion pedal to a gentle but effective compressor. This series offers a solid foundation of effects to both professional guitarists and beginners alike. The devices have their own characteristic sound whilst meeting all standard demands on such effects. 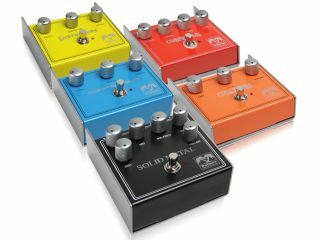 Apart from the great sound, it is the solid, appealing design of these pedals that really stands out. There are two holes in the overhanging part of the housing that can be used to securely screw your pedals on to your pedalboard. All devices have a true bypass, so that when the effect is deactivated, the guitar signal is passed straight through to the output without being affected by the electronics of the device. The devices can be powered by a 9V DC power supply or by battery; the battery compartment is easily accessible on the bottom of the device.